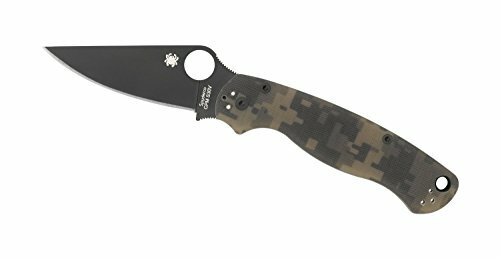 The Para Military provides the performance and reliability of Spyderco's acclaimed Military model in a more compact package. Two-thirds the size of the original Military, it boasts a flat-ground CPM-S30V blade with an easily indexed 14mm Spyderco Round Hole for gloved or large hands. Its handle is constructed of stainless steel liners nested into textured G-10 scales that feature a distinctive digital camouflage color scheme. The Para Military's black DLC-coated blade locks open by means of Spyderco's proprietary Compression Lock--one of the strongest folding knife locks ever produced. Ergonomic curves in the handle profile lock the user's hand securely in place, providing superior control and preventing slippage. A black steel pocket clip supports convenient carry and immediate accessibility, positioning the knife for right-hand, tip-down carry.